This is a new limited production piece, and a variation of the Sinn U1 B which was first shown at the MunichTime Watch Fair in October, 2018. We love asking Sinn to produce special limited production watches, and as soon as we saw the new Sinn U1 B (Blue) we knew that we wanted them to produce a Sinn U1-T B with a fully Tegimented case and bracelet. This is that new watch. The Sinn U1-T Blue features the same great case design made in-house from German submarine steel at Sinn's case making facility in Glashutte, Germany. In summary, the Sinn U1-T Blue is one tough watch that is designed to both last and look great over time. 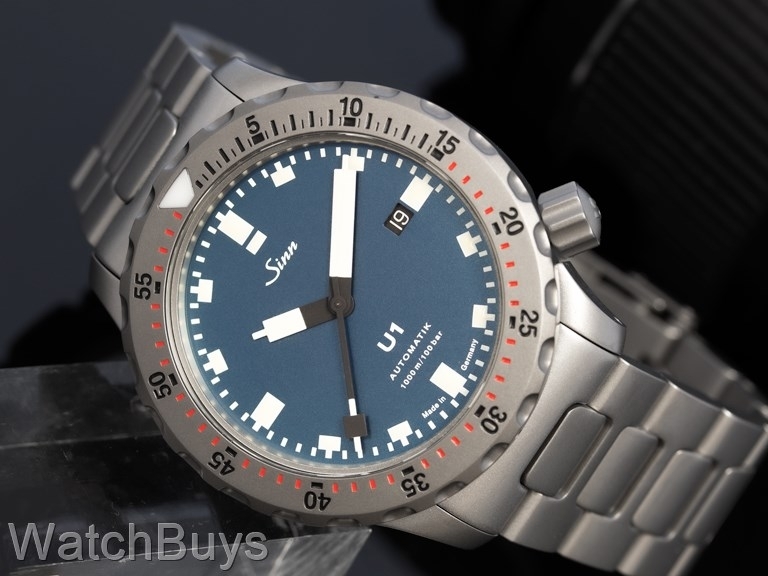 The Sinn U1-T Blue case is made from the same steel that is also used in the construction of the outer hull of submarines. The steel was procured by Sinn from a steel supplier to Emden GmbH, one of Germany's North Sea shipbuilding yards who construct submarines from the very same steel. The international testing lab of Germanischen Lloyd has tested the Sinn U1-T Blue, and determined that the watch can be certified as water resistant to 1,000 meters. This same firm tests submarines for their ability to withstand the effects of underwater use. This watch is fitted with a Sinn Tegimented H-Link bracelet with locking clasp.